It has been two weeks since I have gone nearly caffeine free. I used to drink at least 4 cups of coffee each morning with some days drinking the entire pot and if I didn’t drink any I would have a migraine by late afternoon. I have switched to 1/2 decaf, 1/2 regular and only drink maybe 1 cup now. I most likely could completely eliminate the coffee at this point, but I like the morning ritual of taking the time to wake up with a fresh cup before I start my day. I have tried tea but it just isn’t the same. I will switch to 100% decaf in the next week or so once I finish the container of the 1/2 & 1/2. The most noticeable change (besides not having headaches) has been how hungry I am in the mornings now. This is a big change since I never used to want to eat breakfast even though I knew how important it was to eat breakfast. Then my choice was toast. Now that has changed too….eliminating gluten from my diet. It hasn’t been too terribly hard, but it does take a bit more thought and planning. I have been trying different recipes, some good and others not so great. I don’t eat sandwiches too often so bread has been pretty easy to do without, but I miss toast. I did get some gluten free bread just so that I could have toast, but it is very expensive, so I won’t be having this very often. Also, baking takes on a whole new challenge with the different types of gluten free flours. Thank goodness for Bob’s Red Mill! I am lucky enough to live near the Red Mill store and am able to buy gluten free flours in bulk. I plan on making a new gluten free recipe at least once a week. This past week I have tried two new recipes: Gluten Free Pizza Dough and Gluten Free Pumpkin Bars. These both are excellent and you would never know they were gluten free. I will post the pizza dough recipe soon. 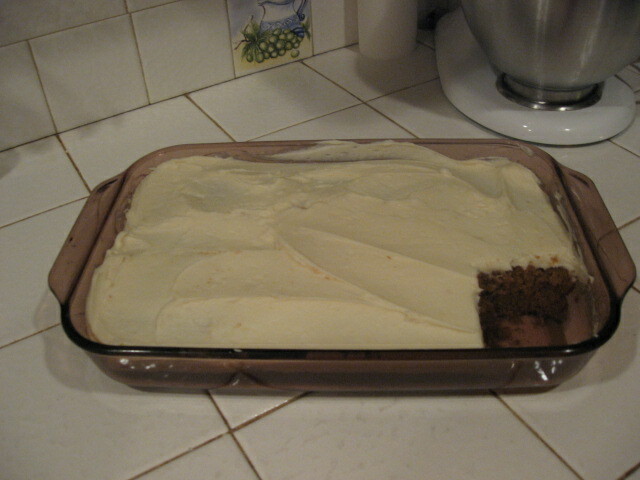 Here is the Pumpkin Bar recipe and some of the changes I made to the original recipe. It is more like a cake than a bar, as it is moist and fluffy. I used pumpkin that I pureed and froze last year instead of canned pumpkin. I changed the refined sugar in this recipe to sucanat as this is less refined. I didn’t change the oil this time, but I will try using coconut oil next time. The frosting is the only thing I haven’t figured out how to change. I am not sure what the alternative for powdered sugar would be other than using whipped fresh cream as the frosting (you just couldn’t frost ahead of time). Preheat oven to 350 degrees. Butter a 9 x 13 baking pan, set aside. Mix eggs, sugar, oil, and pumpkin until light and fluffy. In a separate bowl, mix the dry ingredients and then add to pumpkin mixture. Mix on low speed until thoroughly combined and smooth. Spread into the 9 x 13 pan and bake for 30 minutes. Cool and Frost. Cut into bars. Beat cream cheese, butter, kefir, and vanilla until smooth. Add confectioners sugar and mix to spreadable consistency.